Czech Republic is located in Central Europe bordering Poland to the north, Germany to the northwest and west, Austria to the south, and Slovakia to the east. It is basically a landlocked country strategically located on some of the most important land routes in Europe. The capital of Czech Republic is Prague which is also the biggest city of Czech Republic and a popular tourist destination. Czech Republic became a member of European Union in May, 2004. Czech Republic was earlier a part of Czechoslovakia which was dissolved in January, 1993 and was split into what is now called Czech and Slovak Republics. Brno, Ostrava, Plzeň, Olomouc, , České Budějovice, Zlín, Hradec Králové, Ústí nad Labem, Pardubice and Karlovy Vary are the other important cities of Czech Republic. Czech Republic is divided into two parts based on geographical and cultural classification. They are Bohemia and Moravia. Bohemian cities and towns are popular for their spas and wine vineyards. It is also home to many castles which are open for visitors. One of the other tourism attractions is the availability of hundreds of miles of marked trails for hiking, cycling and skiing. The population of Czech Republic is roughly 10.2 million and the official language being spoken is Czech. The climate of Czech Republic can be termed as Temperate with hot summers and cold overcast winters. It also gets snow. Most of the rain comes down in summer. Due to different altitudes the variation of temperatures is diverse. The temperatures are relatively low at high altitudes and more precipitation. The temperatures average only -0.4°C at high altitude areas whereas the temperatures can average as high as 10°C in low altitude areas. Dressing should be conservative and casual except at formal dinners or good hotels or restaurants. Tipping is usually 5 to 10 percent in restaurant, hotels and taxis. The Castle District (Hradèany) – It has some of the best churches and museums. It also has some beautiful gardens, fortifications and state apartments also. St Vitus Cathedral – It is located in the Castle District, the prominent feature of this cathedral is the spires which soar high in the sky. It is also country’s largest church with great architecture. 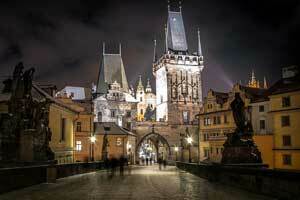 Charles Bridge (Karluv Most) – This is one of the most popular tourist spots of the city and should not be missed. Old Town Square (Staromĕstské Námestí) – It is the most vibrant square of Prague with many historical structures. 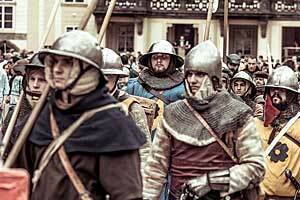 It also hosts various markets every year like yearly Christmas market. The Jewish Museum – It is the largest Jewish Museum in Central Europe with a vast collection of Judaic art works. Vyšehrad – Is a great hill fort built on a rock above the river. By Air – The national airline of Czech Republic is Czech Airlines. There are many other small and popular international airlines operating from Czech Republic. The major airport is Václav Havel Airport Prague (PRG). 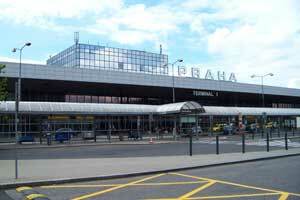 The airport is located approximately 10 miles north west of Prague. By Rail – The country is part of the extensive network of trains connecting the European cities. If you are coming from Western Europe the most convenient connections are via Berlin, Frankfurt, Munich, Vienna, and Zurich to Prague. 1. 800 cigarettes or 400 cigarillos or 200 cigars or 1kg tobacco for EU countries. 2. 200 cigarettes or 100 cigarillos or 50 cigars or 250g tobacco for Non-EU countries. 3. 10 liter of spirits with alcohol content over 22%, or 20 liter of alcoholic beverages with alcohol volume less than 22%, or 90 liter of wine or 60 liter of sparkling wine, or 110 liter of beer for EU countries. 4. 1 liter spirits or 2 liter wine for Non-EU countries.